There is no better news than the news that finds its way to you about making a yearly ‘best of’ list (or one of the many different iterations of the ‘best of’). I’m lucky enough to find myself on the ‘most read’ list over at Writers Bloc with my article “A Practical Guide To Beta Reading”. It’s a double victory because it was one hell of a difficult article to write and was the culmination of a number of ideas I’d had for a long time. To know it hit a chord with lots of readers is quite a nice feeling. You can see the entire list here or do a quick click through to the guide (complete with a handy downloadable PDF). There’s also the companion piece Beta Reading As Translation. Many thanks to Sam and the folks at Writers Bloc for their on going financial support of their blog contributors. 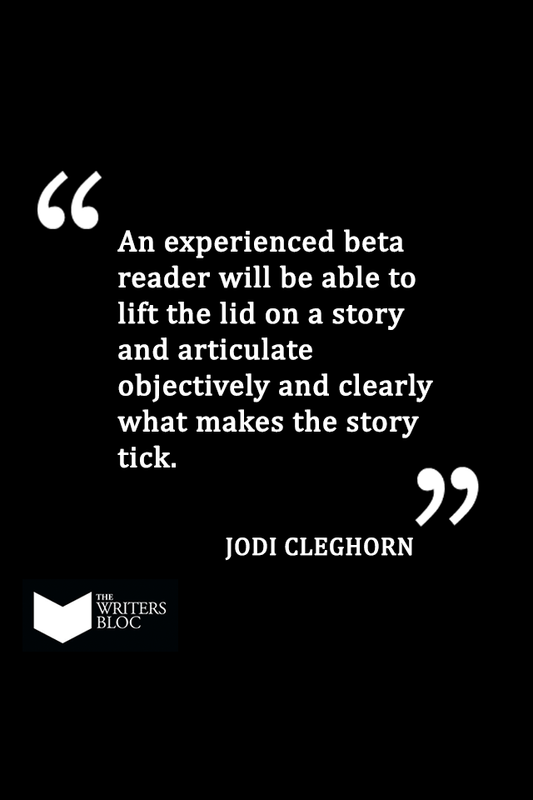 Also a big thank you to my writing group, The Magic Puppies, especially Lois Spangler and Dave Versace, who slipped not once, but twice, down an Inception-style rabbit hole to beta read articles on beta reading! ADDITIONAL NOTE: This post marks the 600th post on this blog! Even more reason to celebrate! 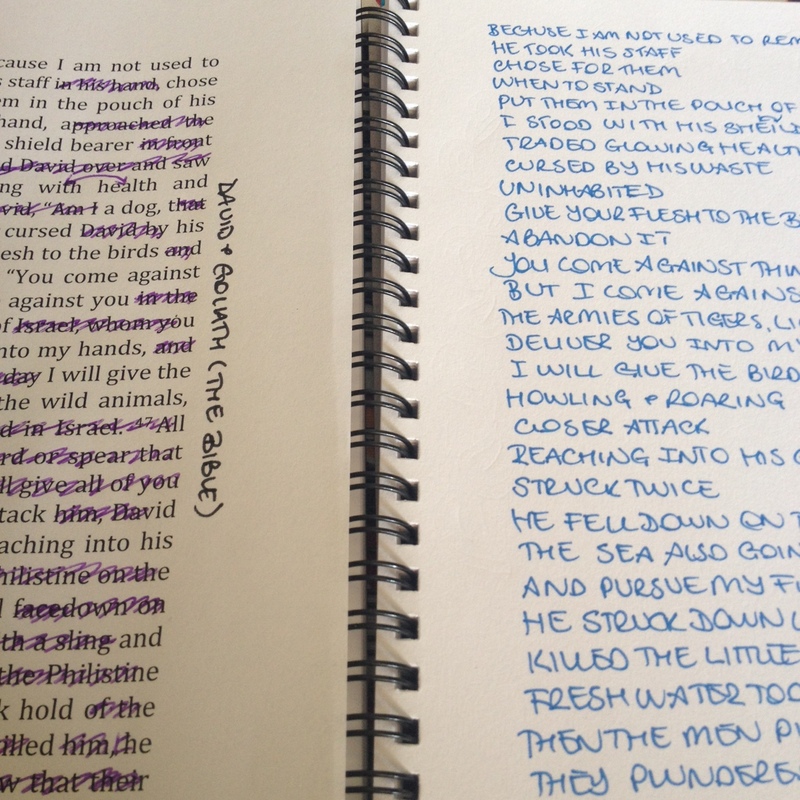 Yesterday I shared, ‘Holding the Philistine‘ the mash-up of Robinson Crusoe/David and Goliath. Today’s poem is born from the reverse halves of the original texts. It shows the flip-side can be both literal and metaphorical! in the pouch of his hand. 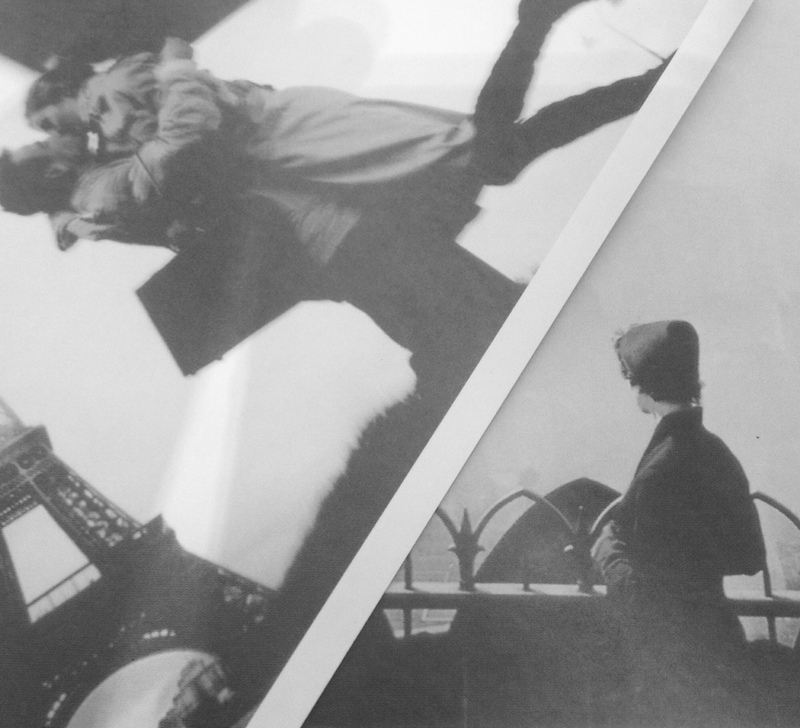 fell down on the winds. Abandon the sea, trade flesh. For the Month of Poetry I committed to creating 31 hybrid poems combining two techniques–fold-in and erasure*–with the view to submit three of them at the end. I am intrigued by the fold-in, at creating absurd juxtapositions or combining writing with common threads (especially when those not immediately apparent) then unearthing what the collision brings. The Cure’s Pictures of You with Henry James’s Portrait of a Lady to create the poems ‘Wickerchair’ and ‘Painted in its Contents’. Bertram Russell’s Why I am Not a Christian with the opening page of the New Testament (as per the suggestion of my partner) to create ‘Before They Became Holy’ and ‘She Shall Bring Fortians’. While I am keeping some poems aside because they are good enough to consider for submission or too crap to inflict on the world, today’s poem was too far removed from the original intent of both pieces of writing that it would have been a travesty not to share! 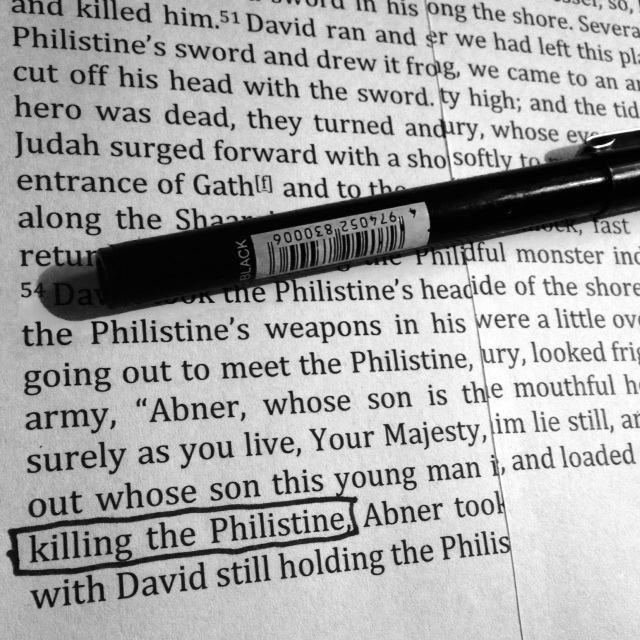 ‘Holding the Philistine’ is the end product between David and Goliath (as told in the Old Testament) and Robinson Crusoe (as told by Daniel Defoe). These were chosen by my son. 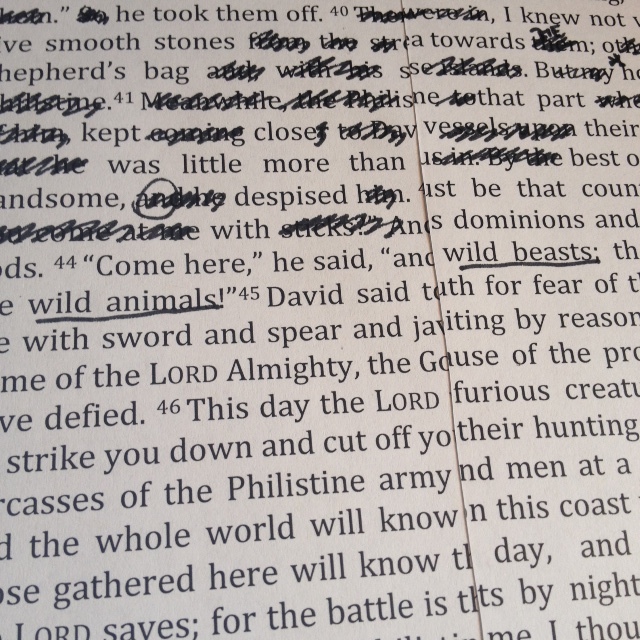 I used the verse number (40) to pick the page number of the novel. I take full responsibility for what happened next! going out to meet him. I knew not where to look. He took off the sword and spear. Lie still, the world will know nothing. *Adam Byatt has suggested “mashinout” as a possible term for this type of poetry! It began New Years Eve (or maybe it began the day before? ), the round-ups of 2014 of those close to me. Even though my year doesn’t begin until February 19th (with the Chinese New Year) I decided I would write something. I wanted to be like everyone else. Surely there was a way to emulate what everyone else was doing? I’d just need to create a division between my life in general and the life I lead as a creative so as to leave something to write about when my creative year ended. In my gut I knew it was not just an artificial delineation but a falsehood, to cleave one from the other. But you know, I wanted to be part of what was going on. Then party preparation for NYE happened and amid them, I ploughed through the different storms of thought, trying to make sense of them. I didn’t make much progress, but glasses were washed, food was prepared and come later on NYE my guests were gastronomically sated and suitably cooled by a night dip. Tomorrow is an ephemeral concept at the turning of the year because it is my thing to stay up to see the dawn, take my first swim for the year and then collapse in bed. So after a five-hour kip, I decided to sit down and write. The computer was flat though, and refused to charge. This continued, not just for a few hours, but several days. What the hell? I just wanted to bloody write my round up. Why was the Universe pitched against me. Why? Because I wasn’t being true to my path and sometimes it takes a computer’s stubborn idiosyncrasies to help you see the light. Mystic Medusa has this phrase: evolve or evaporate. It’s what I was trying to hang my blog post on. I could clearly see how 2014 was a bastardisation of her maxim: evolve or disintegrate. Or evolve or dissolve (which perhaps fitted better the extreme feelings I had of obscurity, imprisonment and invisibility. Of having lost everything I wanted. Of the pointless of the future). When I used it as a starting point in my journal yesterday morning, I fell down a pretty amazing rabbit hole and unearthed insights I would never have found writing a blog post. 2014 was a lesson in surrender — in finally letting go even though it was easier to hold on, even though holding on made life harder and harsher. Fed my depression. Holding on was a habit; a love song to the past I still desperately wanted to sing. And it wasn’t just one lesson, but a raft of them. With surrender came trust, and with trust, came more surrender. With surrender the world rediscovered its axis and me. With surrender the freedom I thought I’d lost came back, not in the way I wanted, but in the way I needed. With this new perspective, I can let go of 2014. It feels ‘right’. It feels okay. Now, I can relish the space between years where new, small projects can blossom in the first glow of a new year and old projects, on the cusp of competition, can benefit from the burst of energy. And later, in February, there will be time to take stock of what actually happened. For now…it’s enough to have grokked the heart of the year that was.